In their drive to create their own Batman, the creators of Darkwing Duck made sure to hit all the important points: the cape, the dark colors, the cool gadgets, the sidekick, the perpetually cloudy night-shrouded city, and the cast of over-the-top villains - including one that the hero dates. 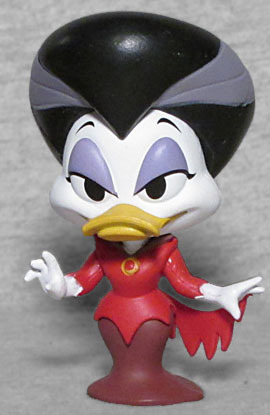 Morgana is the rarest Darkwing Duck character in the assortment, available only in a 1:72 ratio - one in every six cases. Her design is a mix of Elvira, Lily Munster, and the Bride of Frankenstein: she wears a two-tone red dress that covers everything below her throat and leaves her looking like she's gliding everywhere. A swath of fabric trails from the small of her back to her left pinky finger, and her bulbous bouffant hairdo has two grey stripes running through it. The figure is surprisingly stable, despite the big hair, thanks to the lack of separate feet. Her eyes are heavily lidded, and she seems to be smiling. You can decide for yourself whether she's happy or sinister. 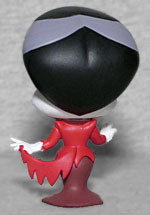 This entry was posted in blog exclusive review, Disney, Funko, TRU and tagged Mystery Minis. Bookmark the permalink.